January 1st, 2018. Another day.. another year. While I am not the type of person who views the changing of the calendar as an opportunity to “start fresh” or say farewell to the problems of the past, I do agree that it’s beneficial to think back upon blocks of time and reflect upon the growth, the challenges, the losses, and the rewards that occurred. Life happens with it’s ups and downs every day and each morning is a chance to make those positive changes in your life, to let your problems go, and to dream new dreams. I’m certainly not the best at this approach either, especially lately, but I try to focus on the fact that I’m at least thinking and believing it and sometimes that’s all I can do. Progress, not perfection, right? The past 365 days have brought me many highs and lows and have been quite possibly one of the most contrasting years I’ve had. As usual I just try to take it one day at a time: I revel in the love and light that has come my way and I do my best to remain positive through the more trying times. I’m a pretty retro/introspective person and I’ll attempt to keep this somewhat short but I wanted to reflect on the losses and gains as well as objectively look at my work and come up with some goals going forward. So here’s to yesterday, tomorrow, and today. Thanks for reading along and feel free to let me know what YOUR photography/artistic goals are in the comments! 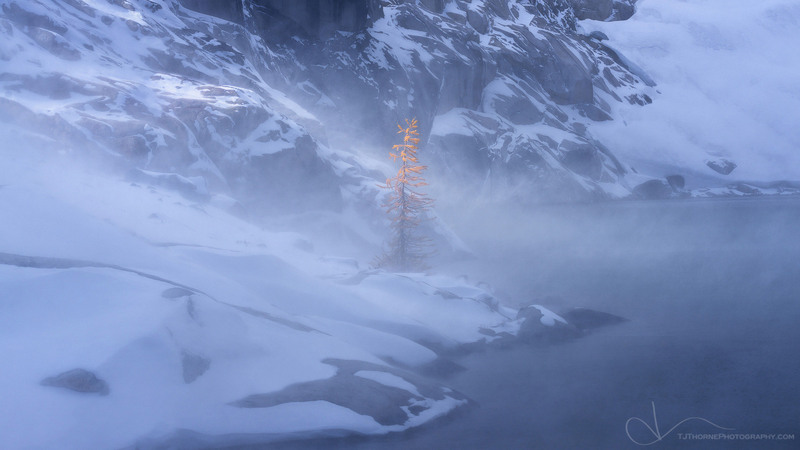 This photo was captured from our camp near Inspiration Lake in Washington’s The Enchantments Wilderness. I had been wanting to visit The Enchantments for a over a decade and this year I was finally granted the opportunity when a friend scored one of the ever-elusive overnight permits. While 50% of our group needed to bail for one reason or another, it was an amazing experience in an amazing place with some amazing people. This trip was full of challenges: the brutal hike in, the high winds, temperatures in the teens, bad knees, and an ill-fitting pack made the trek turn out to be one of the hardest I’ve ever done. But it also brought many rewards: views I’ve only dreamed of, great times and conversation with good friends, exhilarating shooting conditions (we did the majority of our shooting between 11am-3pm), photographic rewards, a closer relationship with nature, and an overwhelming appreciation of my time on this planet. At the end, only Eric Bennett, Michael Bollino, and myself remained. As we chatted in our camp, I had my back turned to this scene when Eric and Michael noticed the little sapling getting hit with the afternoon light. Being the only one to have my camera ready and handy, I set up shop just in time for a very strong gust of wind to come blowing through. It was a fleeting moment and luckily, in the bright light, my shutter speed was fast enough to capture the scene as intended with some nice texture to the snow and no motion blur on the tree. 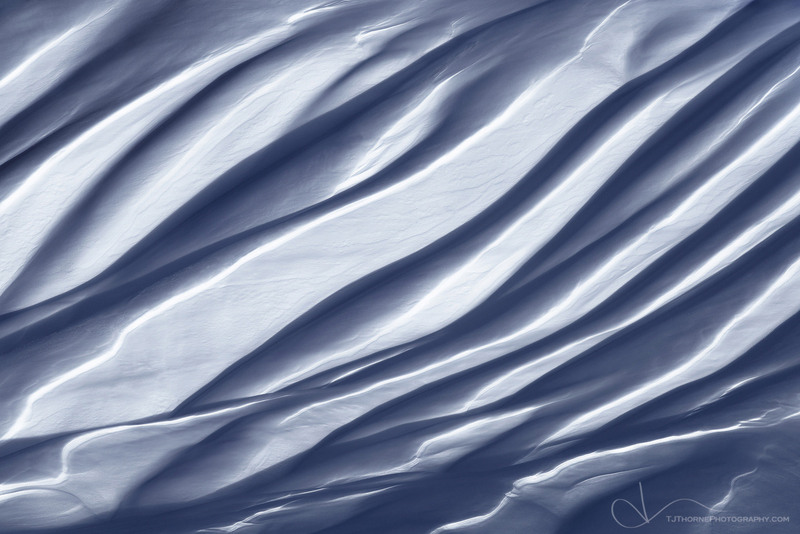 I held my left hand next to my lens to keep snow from blowing onto the glass (I didn’t have the hood on), tucked my head inside my shoulder and just kept pressing the shutter button until the wind stopped. The processing was fairly simple with just some color correction and minimal cloning. I spent the most time on this image deciding on the crop. 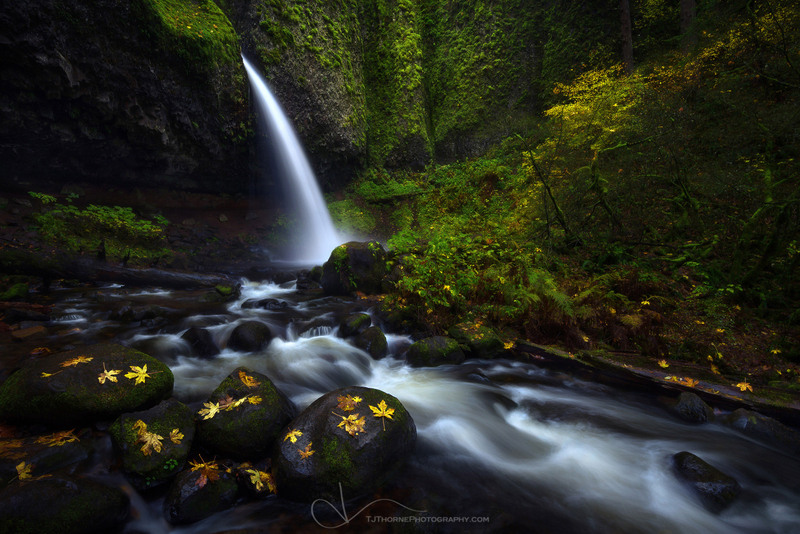 I actually captured this photo as a test shot during my 2016 Autumn Wonders of Oregon Workshop. Only after reviewing the files at home did I really fall in love with this composition and that water texture. All of the lines in the photo point towards the base of the falls and I used extensive dodging and burning to help those lines stand out and to hide some of the messiness in the photo. I did a lot of cloning on this image to clean up the debris in the scene: distracting leaves, pine needles, and a couple branches but most of the work on this photo revolved around color separation, warm/cool contrast, and tonal work. It was a delicate balance trying to get the darker feel I was going for without crushing some of the shadows. No.. I did not place the leaves there but the cloning out of pine needles on the rock really helped them stand out to hold down the left corner of the image. In January 2017 I took a three day road trip in some of the worst winter conditions Oregon had seen in recent times. In the early morning I drove from Portland to the Oregon Coast through an ice storm which laid several inches of ice on the roads to pick up a girl I had never met named Erin Tolie. From there we carried on through blizzard like conditions to Crater Lake, Bend, the Painted Hills, Smith Rock State Park, the Gorge, Portland, and back to the coast to drop her off before I returned to Portland. While we didn’t have many photo opportunities due to the weather, it was time well spent getting to know her and seeing what kind of weather my truck could make it through. I think in those three days we put on about 1,300 miles in blizzard like conditions. This shot is from the Painted Hills which was blanketed in snow. 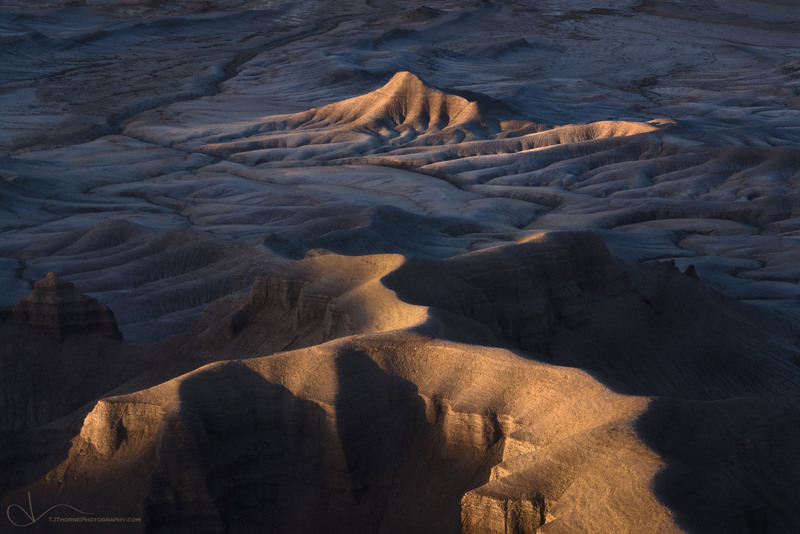 We had the area to ourselves and we were treated to some nice light that really showed off the textures. I went for more of a silvery/metallic feel on this one by playing a delicate dance of blue, cyan, and saturation.. All in the right places. It took a lot of time to get the balance right and I really owe it to my friend Alex for helping me dial in the look. As for the trip.. It was amazing in many ways. Not only did I come away with a photo I really enjoy and that means a lot to me.. I came away with the love of my life. The real story for this image lies in the text that accompanies the image which can be found by clicking the image and reading it on my website. I am really challenged by forest scenes due to their usually chaotic nature. This area is no different. 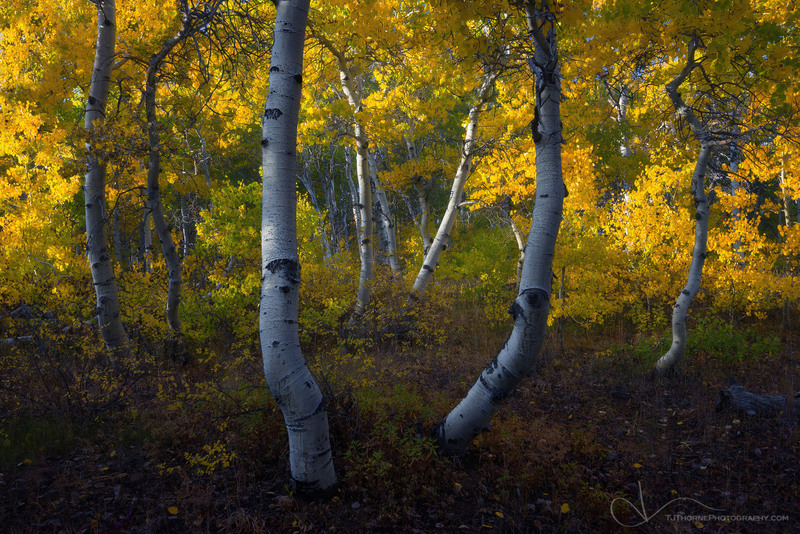 It’s one of the few place in Oregon where there are dense stands of aspens. But these are not the long, straight aspens that you might find in Colorado. They’re short, stumpy, gnarled, and very messy with branches. I was happy to find this composition right next to my vehicle just as the evening light was backlighting the leaves. The balance and symmetry are what really drew me to the scene and I did a lot of cloning of dead/scraggly branches to help simplify it and help that aspect stand out. Aside from that it was just some color work to take it a little more towards the yellow side of the spectrum and making sure that the light in the treetops didn’t overpower the image. This is one of my favorite compositions to date. This location, which is steadily gaining popularity, is a total blast to photograph. I spent most mornings and nights on my first trip to Utah photographing this location. While normally I would be inclined to jam as many locations into an itinerary to make the most of my trip, there’s a great benefit to visiting the same location over and over again. The way this scene changes as the light moves across the landscape is mesmerizing. Sunrise has a completely different feel than sunset and different shapes, textures, and features stand out. The night before I captured this photo I had the idea to capture the peak in the background in light, isolating it using a longer focal length so that everything else around it was shadow. When the light started happening, I also noticed the feature in the foreground was receiving light in all of the right places and decided to photograph this composition as well which, in the end, I was more drawn to. The typical processing for this scene is to go really blue. While the unlit hills are grayish blue, I decided to be really conservative with the application of blue here as I wanted it to have a very realistic presentation. It was the light here that did most of the heavy lifting so I spent most of my processing time making sure that I had the color and saturation exactly where I wanted it so that the light and composition did the talking. I’ve never been drawn to Wahclella Falls in a photographic way and most of the times I’ve been to this location I didn’t take any photos. On this day I was accompanying my friends Andrew Studer and Michael Shainblum and I spent most of the time just taking in the scene and hanging out. When the sunlight crested the canyon walls and started to hit the water I took my long lens out and started playing with water abstracts using the light and mist from the splashpool of the falls. 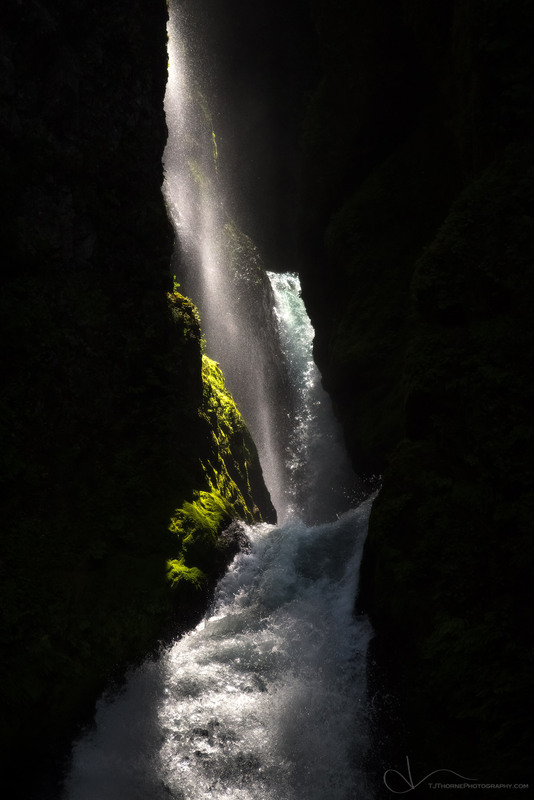 I loved the way the light was pouring into the canyon above the main falls and lighting the upper tier which is usually unseen and forgotten. This is probably my most unprocessed file. I normally do a lot of very small tweaks in the process of making my images but for this one it was pretty straight forward and it was all done in Adobe Camera Raw. Making sure that the water was bright but not too bright and that the shadows on the sides of the falls were very dark but still retained a small amount of detail if you really looked was my goal. A lot of photography advice out there suggests shooting waterfalls in soft, overcast light only but some of my favorite waterfall photos I’ve ever taken were in harsh light or used the light in some way to make the image more compelling. As I stated before this was a pretty tumultuous year so to keep it simple I’ll keep this to photography only. The Eagle Creek Fire in the Columbia River Gorge. This was by far the most traumatic event of the year for me. Not only is the gorge a place that meant a lot to me, it was also a large part of my living as a photographer. To see it raining down on my car in ashes was heartbreaking, frightening, and demoralizing. I have gone through the stages of grief and have come to terms with the event, but even last night I was thinking of all of the user trails to rarely visited places that I was fond of which will likely never be repaired.. At least not for a long time. I’m grateful that I live in such a beautiful and bountiful area of the country and that there are endless places to explore and photograph. I wrote about the fire in the description for my image Healing Waters. I took more trips to places I had never been. I left my job of 15+ years to pursue photography full time. I became more artistically conscious about the type of work I want to create. You can read about that in my blog post Old Shoes. I fell in love with someone who has helped me break into a new consciousness around photography. Someone who is extremely creative, original, exciting, and talented beyond measure. Someone who both inspires me and pushes me to create and be productive. I was more productive in 2017 than I was in 2016. Continue to explore areas in and outside of Oregon. I have a lot of places on my list that I’d like to visit and need to make it a priority to do so. Read more writings on artistic philosophy and photography. Experiment more. I have a tendency to write images off based on the raw file instead of playing around with images that grab my attention to see their possibilities. Get out more both with and without a camera. Continue to define my own personal style. I am happy with the quality of the work that I’m producing, but I’m unable to view it as being cohesive. Granted, I shoot a wide variety of things which causes a differentiation in style in itself.. So maybe it’s just a byproduct of my style of shooting changing. Be more outgoing and engaged. As I look back on the goals I set last year.. I was happy to see that I had made some progress. I think getting out more is going to be a huge help. I’m not nearly as exhausted from stress as I used to be.. But I’ve been bad at holding myself accountable and if I want to succeed in this that’s going to have to change. Thanks for reading.